In what seemed to be one of the few actual gameplay demos shown at Bethesda's E3 presentation, Arkane Studios' Dishonored 2 was showcased, said to be arriving in stores on November 11th of this year. 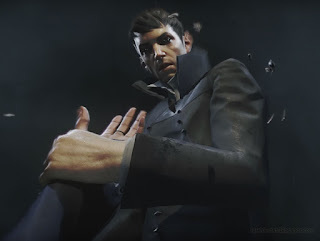 The sequel to the 2012 stealth/action game Dishonored puts us back with Royal Protector Corvo Attano in the city of Dunwall, but branches out with a new character Emperess Emily Kaldwin in the city of Karnaca, allowing for expanded and varied gameplay styles and a much larger world. Check out Dishonored 2's gameplay trailer below. It'll be heading to PlayStation 4, Xbox One and PC on 11th November with a limited Collector's Edition featuring Corvo's mask, Emily's ring, a steelbook copy of the game, propaganda poster, digital copy of Dishonored: Definitive Edition and the Imperial Assassin's Pack DLC.